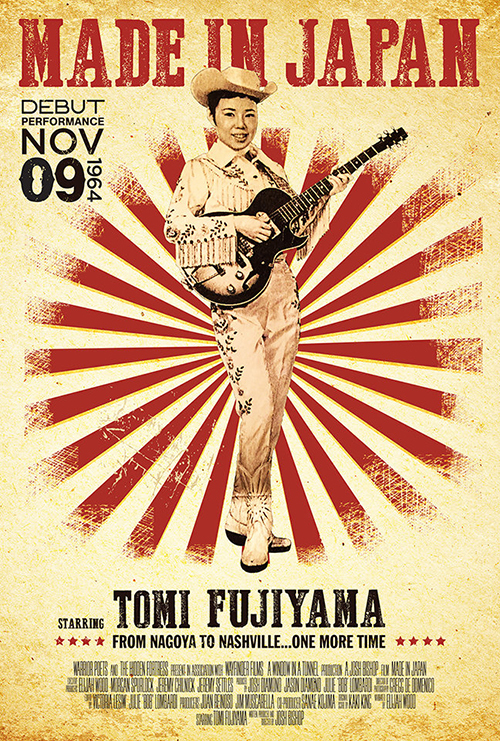 Tomi Fujiyama is a world-class country singer and a pioneer of the genre in Japan. She was born on January 10, 1940, in Nagoya, Japan. Tomi has released 15 78-rpm records, 18 singles, 7 LP s, and 4 CD albums. She also published her autobiography, Korobi Korobuyo Ongaku Jinsei, in 2004. From 2000 to 2007, Tomi appeared on NHK's radio program Radio Shinya Bin as a regular. Today, she is still active at the forefront of the music scene, holding concerts and appearing on different media with various artists, both at home and abroad. In the early 1940s, Tomi’s family evacuated to her mother’s hometown, the city of Owase in Mie prefecture, as the bombing became more intense in Nagoya. At the end of the Second World War, the family returned to Nagoya and reopened their family-run clothes shop. The shop was small but had plenty of customers. Tomi's father, the owner of the shop, loved trying novel things. For example, he bought a BMW motorcycle and rode around the town; he also bought an electric gramophone with an integrated radio and loudly played music or sports programs, such as baseball or sumo wrestling, in front of his shop, attracting more customers. When Tomi was about three years old, she started to memorize songs from records and radio. Her particular favorites were traditional Japanese pop songs, called Kayokyoku. In 1946, as Tomi entered elementary school, she started to participate in amateur singing contests. At the age of nine, she confessed to her father that she wanted to be a professional singer. While Tomi was accumulating experience as a singer, she was scouted by a local production company, and she started her career as a professional singer in 1949. Her first stage name was Mihato Yamaji, and she went on provincial tours, mainly in the Tokai region. In 1953, a production company in Tokyo featured her at the Asakusa Shochiku Engei Hall, a famous theater in Tokyo, where she went on to perform regularly. In the early post-war period, Japanese theaters often presented a variety of programs, such as cinema, popular song shows, and comedy plays. One day, a theater in Hamamatsu city, in Shizuoka prefecture, scheduled the Mihato Yamaji Show. During the rehearsal, Tomi noticed that one of the piano’s notes was slightly out of tune and explained this to the band members. Far from agreeing with her assertion, the band members insisted that the piano was correctly tuned. Tomi and the other members quarreled and, finally, the manager of the theater sent for a piano tuner to confirm it. The piano tuner agreed that the note was slightly out of tune, as Tomi had pointed out. Instead of apologizing to her, the band members were offended and surprisingly walked off the job. She could not sing without the accompaniment of the musicians, and the concert was canceled. Following this incident, Tomi decided to accompany herself with her guitar and started to take classical guitar lessons, which played an important role in establishing her style of singing all types of music, from pop to jazz to country, with her own accompaniment on the guitar. Tomi’s father realized that she had a great talent for music and devoted himself to creating a good environment for her activities. He not only supported her performances as a capable agent, but also played a significant role as her exclusive sound engineer. He amplified the sound of Tomi’s classical nylon-stringed guitar by attaching a special mic to the sound hole, which was technologically ahead of its time. He also built homemade guitar amplifiers and developed original wireless equipment. Tomi could move around on the stage thanks to this system. At the age of 13, Tomi moved to Tokyo. There, she signed a recording contract with Teichiku Records at the age of 14 and made her debut as a pop singer. Her first stage name was Tomoko Yamaji. She later switched musical styles to become a country singer. Tomi’s TV-commercial song “Song of Oriental Curry” was a smash hit. 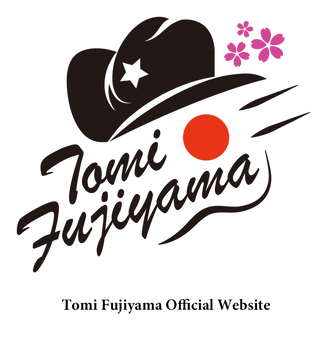 Tomi moved over to the Nippon Columbia record label and changed her stage name to Tomi Fujiyama, in honor of both Aiichiro Fujiyama, the honorary chairman of Nippon Columbia at the time, and Ichiro Fujiyama, a famous pop singer. Tomi often gigged at clubs on the US military bases in Japan, where her performances were well received by the American soldiers. Later in the year, she was contracted to The Mint Las Vegas in the US and performed there for 72 continuous weeks. Her great success in Las Vegas led to her appearance on the TV program Grand Ole Opry, which was the supreme stage of country music. Tomi followed a performance by legendary singer Johnny Cash and received a standing ovation for her rendition of “The Tennessee Waltz.” The show was broadcast all over the world by the Associated Press. Tomi also appeared on ABC's popular talk show the Les Crane Show and on the Danny Thomas Show. Tomi’s single “Lonely Together” hit the US chart in the country music category. She became the first Japanese country singer to rank in the chart. After a one-and-a-half-year tour in the US, she returned to Japan. During the Vietnam War, Tomi accepted an offer from an American promoter to entertain the troops in Vietnam for three months. After that, she toured other US military bases in Southeast Asia and the North Pacific (Taiwan, Philippines, Thailand, South Vietnam, Guam, and Saipan). Tomi began studying under jazz guitarist Koichi Hiroki. She successfully incorporated jazz harmony into her repertory, for example, “Georgia on My Mind” and “Summertime,” thus developing her own cross-genre style. Tomi’s Lonely Together album was released. It contains a wide variety of works, such as the title song, which was formerly released in 1964 as a single. For the album, the song was rearranged and has new Japanese lyrics. Tomi appeared on WSM’s (Nashville) Midnite Jamboree. Tomi's original song “Boogie Woogie Yodel” was broadcast on US and European radio stations with the introduction of Comstock Records (US). The song jumped to fifth place on the Indies chart and fourteenth place on the European music chart. Tomi appeared on NHK radio’s live program Radio Shinya Bin – Enjoy Country with the show’s anchor, Sumiko Muromachi (2000 to 2007). Tomi’s second album, GOLD- Visit America, was released. Tomi had a gig with Dr. K Project in Bangkok, Thailand. Tomi’s autobiography Korobi Korobuyo Ongaku Jinsei was published. At the launch event, she performed with Ryoko Moriyama (vocals), Kenichi Nagira (vocals), and the late Hiroshi Kamayatsu (vocals). Tomi also performed with Koichi Hiroki (guitar) at Asahi Hall in Hamarikyu, Tokyo. Tomi performed with Koichi Hiroki (guitar) and Hiroko Kokubu (piano) at Yakult Hall in Shinbashi, Tokyo. Tomi’s concert Tomi Fujiyama's Wagamama Concert – TOMI IN THE BOX was held at Sougetsu Hall in Akasaka, Tokyo. The concert was produced by Toshikatsu Kawamura and Tomi performed with Takeshi Shibuya (piano), Koichi Hiroki (guitar), and the late Ryojiro Furusawa (drums). Tomi’s concert Tomi Fujiyama's Wagamama Concert Part 2 was held at Sougetsu Hall in Akasaka, Tokyo. It was produced by Toshikatsu Kawamura, and Tomi performed with Masahiro Sayama (piano), Kazutoki Umezu (saxophone), Teruo Matsumoto (drums), Masaya Kimura (tenor saxophone), Takafumi Watanabe (trumpet), Hironobu Tanabe (guitar), Mishio Ogawa (vocals), Hiromi Takeuchi (chorus), Midori Tanaka (mc) , Koichi Hiroki (guitar), the late Toshiji Ookawa (bass) and the late Ryojiro Furusawa (drums). Tomi’s Shuku Haru Ichiban concert was held in Osaka. Tomi performed a gig at Blues Alley Japan in Meguro, Tokyo. Tomi appeared at the Bankei Jazz Festival in Sapporo. Tomi held a gig to celebrate her seventieth birthday at Jirokichi in Koenji, Tokyo. Tomi’s solo acoustic album Showa Kayo Meikyokusen was released. This album featured Japanese traditional pop songs, so-called kayokyoku. Tomi held a concert at Asakusa Kokaido. Tomi, together with Sumiko Muromachi, held a concert titled Radio Shinya Bin Saigen Concert at Koendori Classics in Shibuya, Tokyo. The concert followed the same format as NHK’s radio program of the same title. Tomi appeared on Music City Roots in the US. Grammy Award winner Alison Brown performed for her as a special guest. Tomi also appeared on Bluegrass Underground in the US and performed with Ralph Stanley. A documentary film about Tomi's life, titled MADE IN JAPAN and directed by Josh Bishop, was made. The film was narrated by Elijah Wood, who played a leading role in The Lord of the Rings. MADE IN JAPAN was screened at various film festivals, including South by Southwest 2015 in Austin, Texas (Tomi made a guest performance), the Nashville Film Festival 2015 (Special Jury Prize for Best Import), the Hot Springs Documentary Film Festival in Calgary, Canada, the Asian American Panorama in San Diego, the Cinefamily in Los Angeles, and the Hawaii International Film Festival. Tomi made guest appearances at these festivals. In this year, Tomi also appeared on Grand Ole Opry for the first time since 1964. Tomi still has many gigs at various live houses in Tokyo, mainly in the Kanto area; for example at Happon in Kunictachi, Bronco in Utsunomiya, and Tiara Koto in Koto. Also she performs in various places throughout Japan. Tomi, together with Sumiko Muromachi, held a concert titled Radio Shinya Bin Saigen Concert vol.13 Final at Koendori Classics in Shibuya, Tokyo on October 1, 2018.